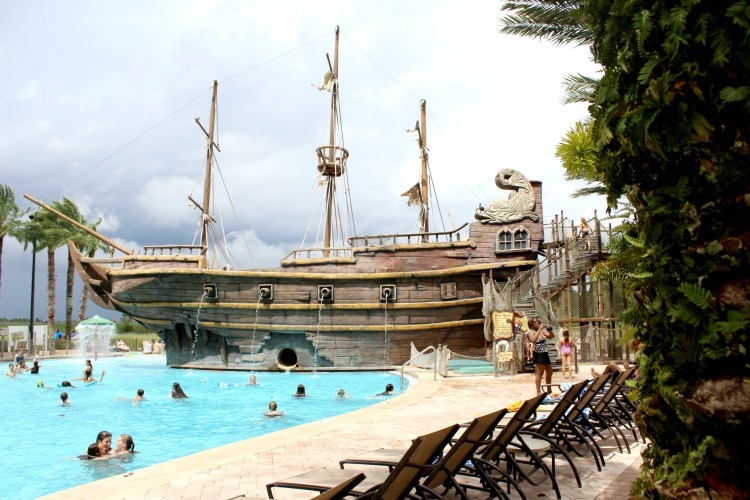 Planning an Orlando vacation? You’ll need a place to stay. 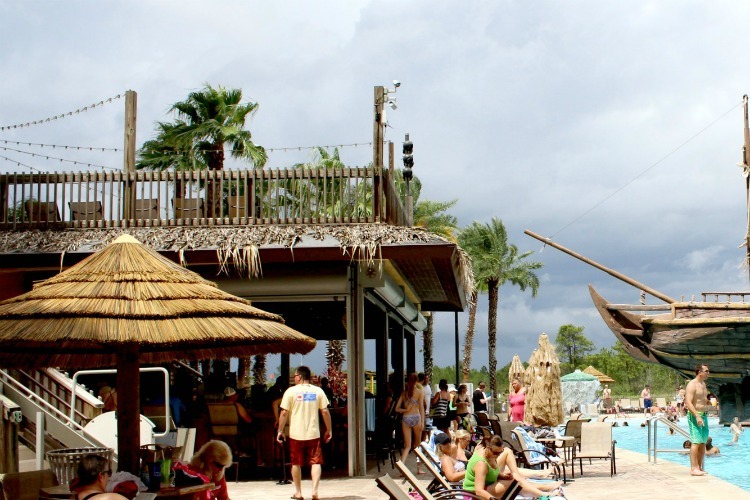 Whether you’re taking a kid-free vacation or bringing the entire family, the Lake Buena Vista Resort Village And Spa makes a great option. 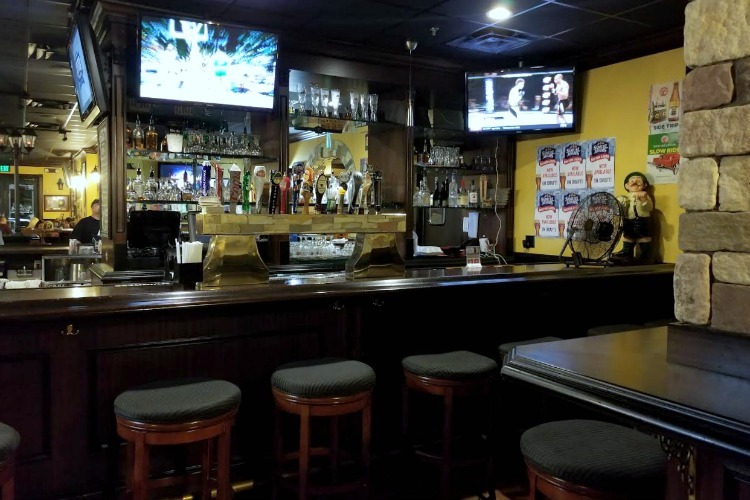 With condo style suites, a convenient central location and plenty of amenities make your life easier, this hotel has a lot to offer. In fact, you’ll find that just the pool area alone makes this a place worth checking out. When we handed off the kids to grandma and grandpa for a summer vacation, my husband and I immediately started planning some getaways. We don’t get many kid-free vacations and we wanted to make the most of it. After a quick trip to Clearwater, we decided to head to Orlando where I’d booked a stay at the Lake Buena Vista Resort Village And Spa. 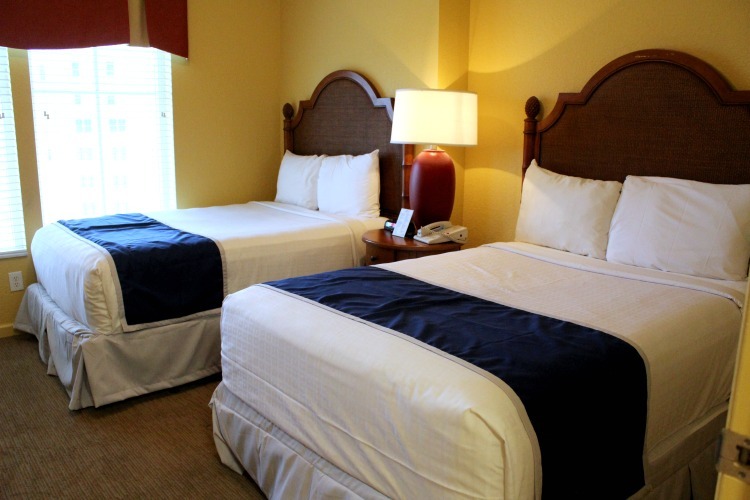 With condo style suites and a great central location, this hotel had just what we needed. 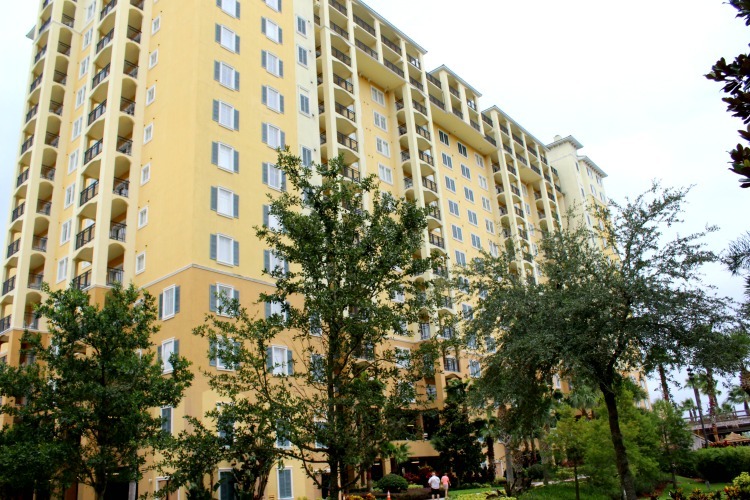 Staying in a central location is important when you’re planning an Orlando vacation. You don’t want to spend your vacation sitting in your car and Orlando traffic is no joke. 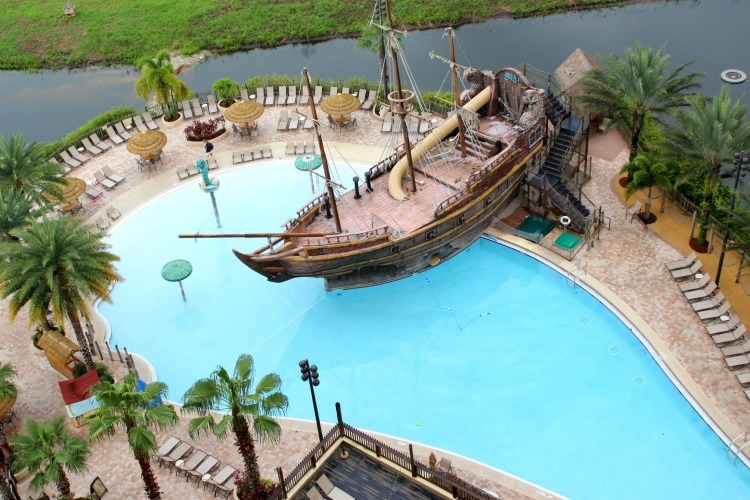 Located just off 417, this hotel is about 15 minutes from Universal Studios and 23 minutes to the Magic Kingdom. We may have been skipping the parks but we still had date night plans in Disney Springs, only 11 minutes away. Unlike a standard hotel room, when you stay here you’re living in a condo style suite. 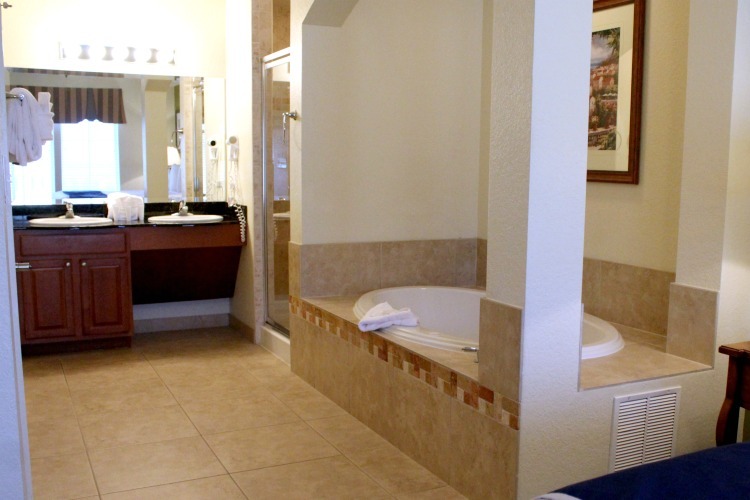 Ours had two bedrooms but you can choose to stay in a one, two, three or four bedroom suite. One of the big advantages is that it comes with a full kitchen. Since food is usually a big vacation expense, this saves a lot of money, especially if you’re traveling with a big family. 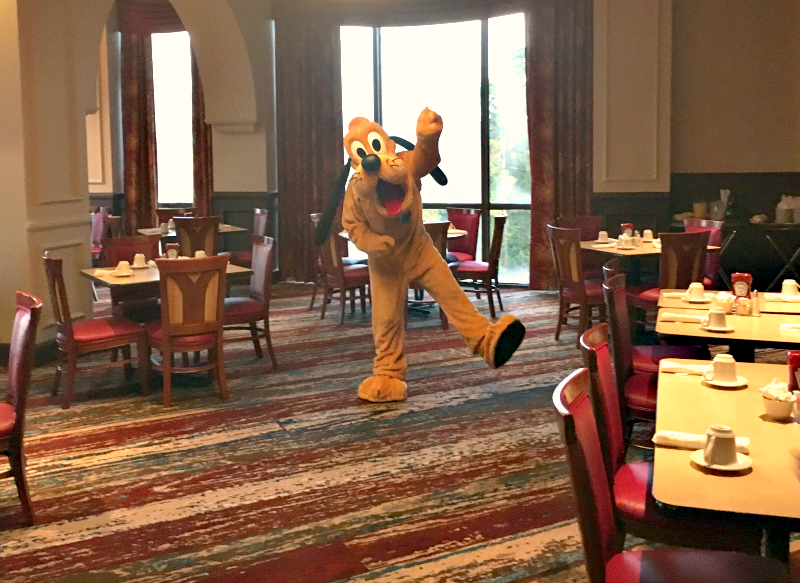 If you are flying in, you can choose to have groceries delivered from Orlando Grocery Express and the hotel will even put them in your room for you. Depending on when you book, rooms can be as low as $179 for a 2 bedroom/2 bath suite (I found that price when they offered a mid-July flash sale). 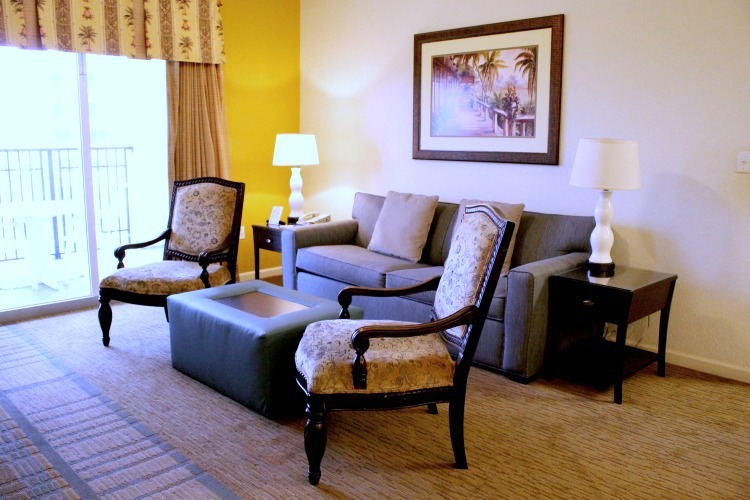 Normally, these suites run $250 per night, which is still a great deal when you look at all that you’re getting. A two bedroom suite will actually sleep six since the sofa pulls out to make an additional bed. The guest bedroom came with two double beds and plenty of storage space for clothes and suitcases. The master bedroom was clean and bright and like the guest room, had its own television. I liked the fact that our master bath had two sinks and came with a large jacuzzi style bathtub. Daily maid service isn’t included but you can add it for an extra fee. Since it was just the two of us, we didn’t really need it anyway. However, if we did happen to need extra towels, we would have been able to wash them ourselves since the suites also come with a washer and dryer. One of my favorite things about staying here was the balcony overlooking the pool. It was nice to sit outside and start the day with a cup of coffee and a pretty view. Even though the pool was right under us, we never heard any noise unless the windows were open. 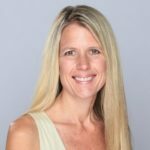 TravelingMom Tip: If you live in state, be sure to check out the deals that are offered exclusively for Florida residents. When I saw the pool, I couldn’t help but feel a little guilty for coming without the girls. 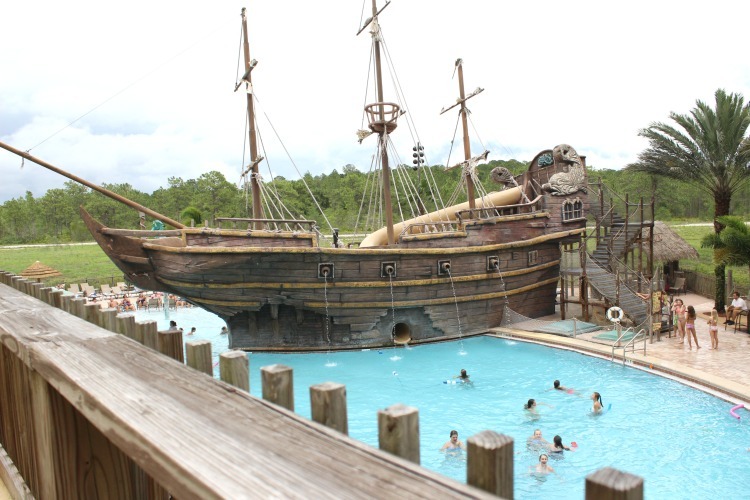 They would have loved the giant pirate ship, complete with water slide going through it. Though it’s obviously there for the kids, even I thought the pirate ship was pretty awesome. Every kid in the pool seemed to be having a blast. 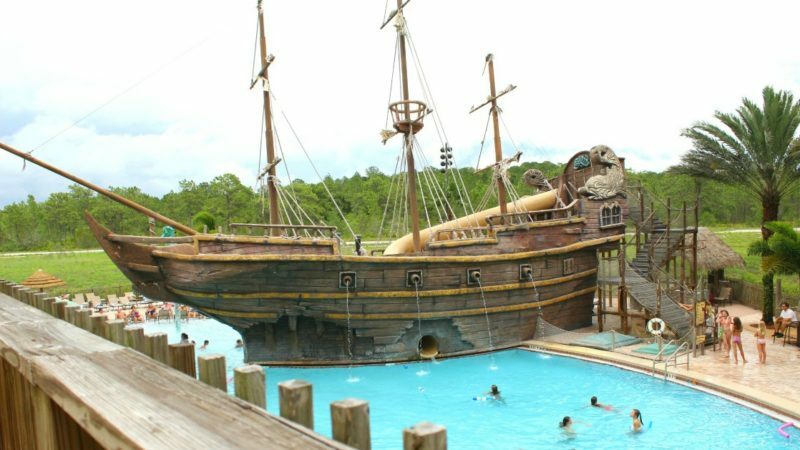 Since it’s open until ten, you may even be able to squeeze in some pool time after a day at the theme parks. Though this is a fantastic pool for kids, there was plenty for adults to enjoy as well. Lani’s Luau pool bar serves adult beverages, as well as sandwiches, salads and more. You can even enjoy breakfast at reasonable prices, with breakfast sandwiches under $5. Looking for a little more seclusion? 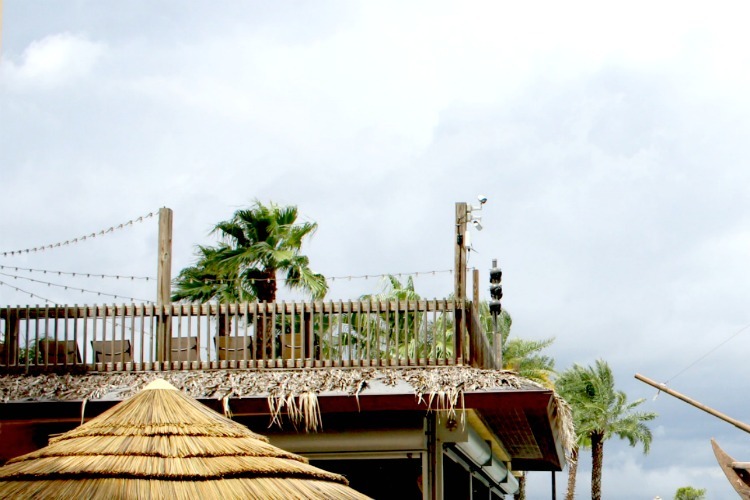 Grab a margarita and head to the rooftop of Lani’s Luau. While the kids were splashing around in the pool, we found that this kid-free area was perfect for enjoying our drinks and reading magazines. 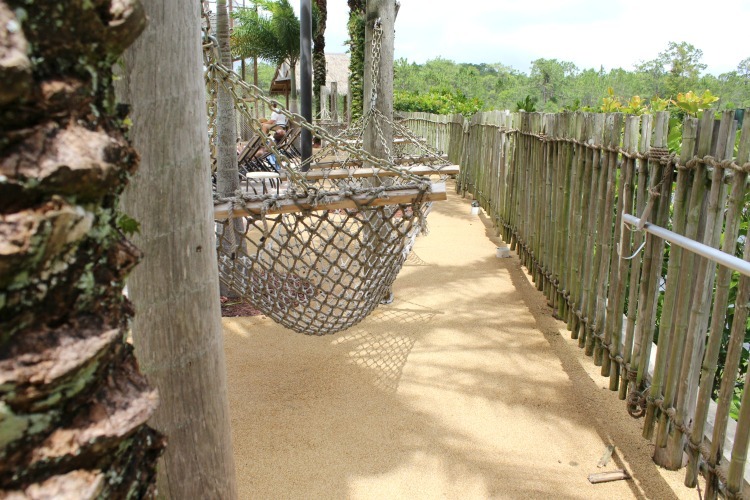 There are even hammocks if you’re in the mood for a little nap. 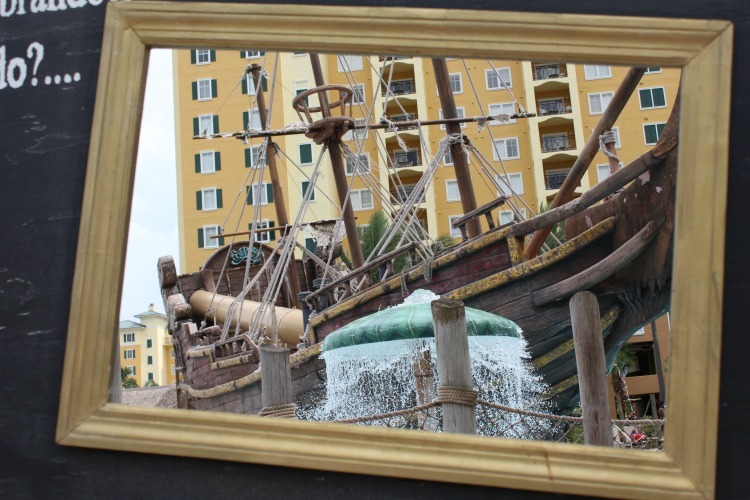 TravelingMom Tip: Don’t miss the picture frame where you can take a fun souvenir shot of the ship. 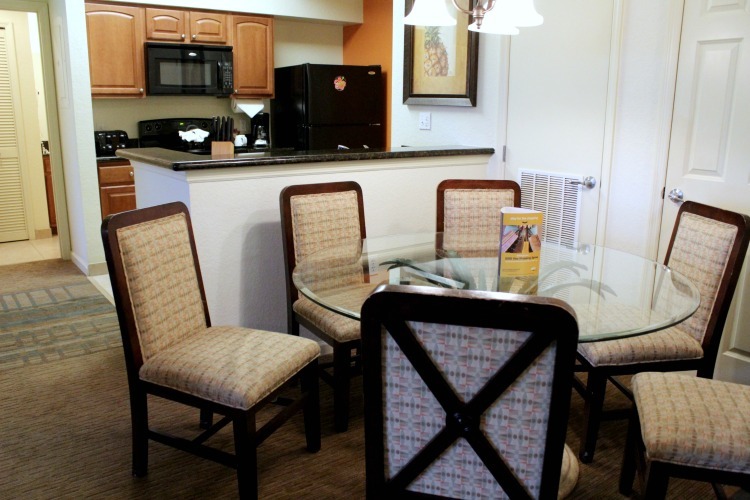 Because each suite has a fully stocked kitchen, you can save money by preparing your own meals. There’s a convenience store on property with plenty of food or you can have groceries delivered. If you’re not in the mood to cook, there are several other options to choose from. 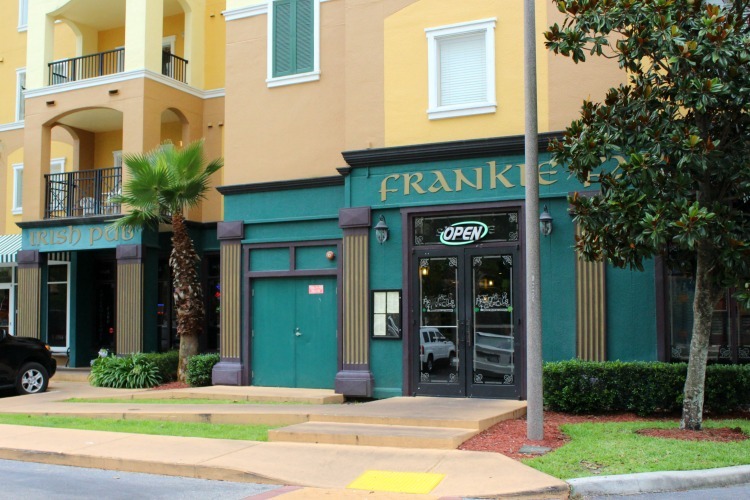 In addition to Lani’s Luau, you’ll find a Pizza Hut and Frankie Farrell’s Irish Pub. We stopped into the pub for a pint and it was nice being just a short walk away from our suite. Since I was kid-free, I made time to visit the Reflections Full Service Salon & Spa for their Island Bliss Hot Stone Pedicure. It’s similar to a hot stone massage, just for your feet. It was so relaxing that I almost fell asleep! You can also treat yourself to a manicure, massage, facial, body treatment or hair care treatment. Even the kids enjoy spa services at this resort. There’s a Little Mermaid Teen Facial, an ice cream manicure and pedicure or a princess makeover. 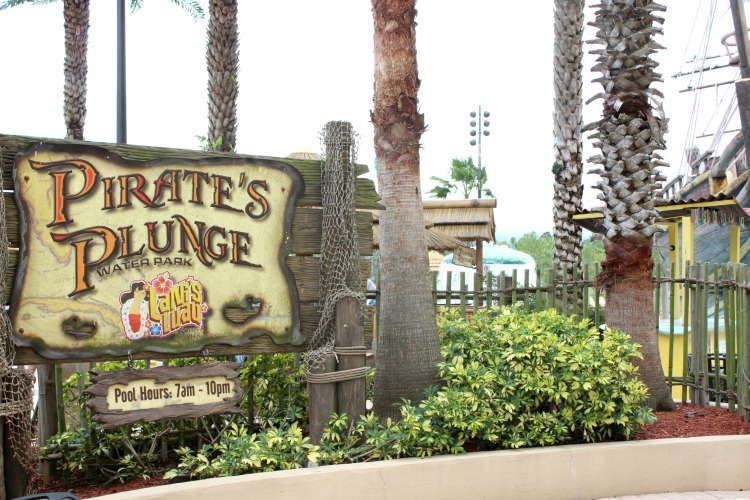 Boys aren’t left out…they can get a Pirate Takeover. We would happily stay here again, especially if the girls were with us. 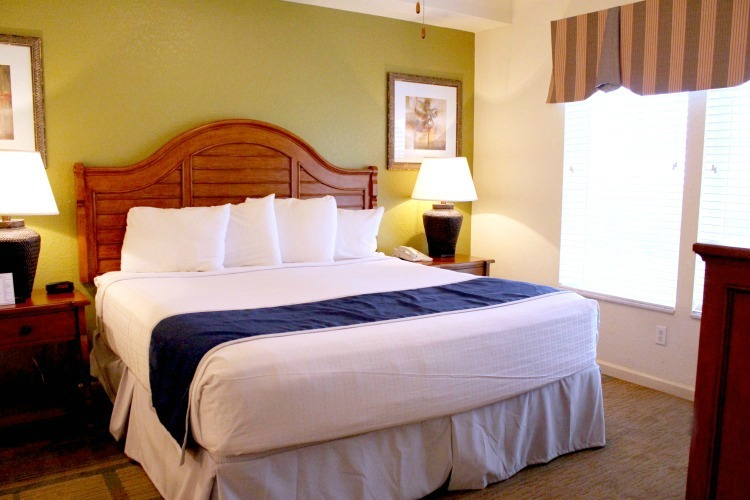 With reasonable prices, suites up to four bedrooms and plenty of amenities on site, this is a great option whether you’re traveling as a couple or with the entire family.